I am Using the Latest Version 11 of ERPNext, and I am using multiple Companies. In HR Module, I noticed a few bugs concerning the Filtration of Companies. I have found bugs in “Leave Period” as well, when clicking on “Grant Leaves”. Also in “Salary Structure Assignment” when clicking on “Assign To Employees”. I am assigning Salary Structures and Granting Leaves Employee by Employee. Please help me with this Issue ASAP. Your problem that it is not filtering for the selected company? If that is the case, then you can do this using custom script. @bghayad I am facing the same issue here! I tried to do that but found the code vary dynamic and complex. In which doctype you tried to do this and what field you were need to filter it based on the company? my case is I have multiple company and I want to transfer the employee from one company to another. 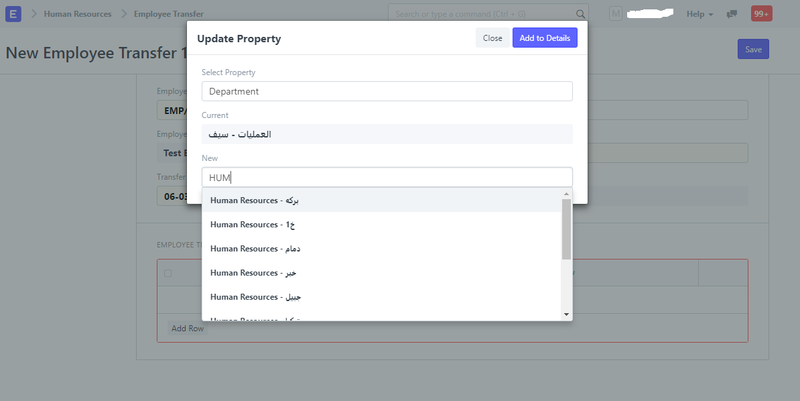 when I select property “Department” it will list all departments from all companies!